Shankland Insurance provides optimal products and services and is active in the communities that they serve. Being active involves donating time and resources to local organizations and groups that enhance the community. Editor's note: The Charles City Rotary Club is celebrating its 100th anniversary in the community this month with a special event on Oct. 22. A few club members are offering their perspectives on club membership leading up to that date. Back in 2013, Gene Parson asked me to come to a Rotary meeting with him. He thought it would be a good way for me to network with other local business people. I was one year into the ownership of the Shankland Insurance, and I felt it was a good fit for me. But, besides the professional connections and business relationships to be had, I just wanted to get involved and make a difference in my community. "Community" held a different meaning for me. I was raised in the suburbs of Chicago. I went to a high school where there were 3,116 students attending. I graduated with a class of 769 students! 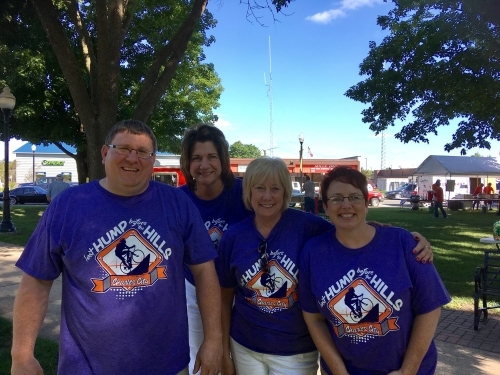 Needless to say, the memories and involvement with community and peers were entirely different for me than is the norm for someone from Charles City, or any small town in Iowa. I had heard of service clubs. My predecessor, Steve Shankland, was a Rotarian at one time as well as a member of the Floyd Lions. My good friend Gary VanderWerf belonged to Kiwanis. I heard about the Jaycees and had out sandbox filled a couple of times. But, I didn't really know how to get "invited" or join one. I've lived in Charles City (and now Bassett) since 1996 when I moved here from Elmhurst, Illinois. So, now fast forward and I'm ready to give "service above self" and belong to a group of people with common goals and a heart for humanity as I have. And, ultimately, I've found Rotary has blessed me far beyond whatever volunteering or "giving of self" I can do. Rotary has guiding principles that serve not only the individual, but the world. These principles have been developed over the years to provide Rotarians with a strong, common purpose and direction. They serve as a foundation for our relationships with each other and the action we take in the world. This month the Charles City Rotary Club is celebrating its centennial! 100 years of service to Charles City by people like Dr. J. B. Miner Sr. (1920), Tom Beardmore (1930), Harold Winterink (1930's), Leo Schula (1940's), Paul Garthwaite (1950's), Jack Frye, James Smith, Ralph Smith, Andy Cerio, Jody Meyer, Barb, Sam and Scott Soifer, Cathy Rottinghaus just to name a few. The list is long and filled with wonderful people sharing the same goal and passion for Rotary. I am honored to be counted among them as the club's 101st president. This little local Rotary Club of 48 current active members is part of a global community of over a million people. Together, we see a world where people unite and take action to create lasting change - across the globe, in our communities and in ourselves. A new Lodge Year began on April 1. The Elks pictured will be leading the organization this year and were installed in their respective offices over the weekend. Thank them for accepting this responsibility the next time you see them. Saving the world one tree at a time and having fun together! 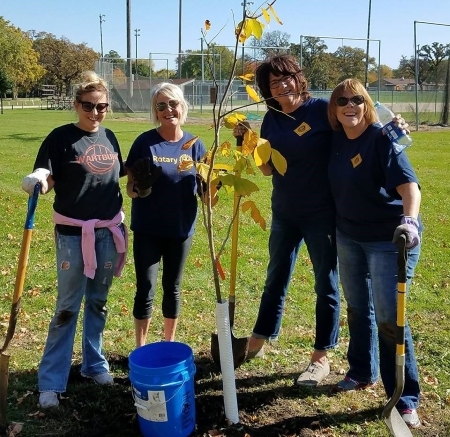 Charles City Rotary tree planting in Charles City with Kelsey, Kay, Staci & Jane. 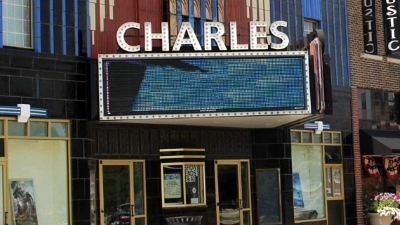 Staci enjoys volunteering for the local Charles Theater. Staci is also a member of The Elks, and is currently representing NE Iowa on the Iowa Elks Accident, Prevention and Insurance board. Staci is very active with the local Rotary club. Staci participates by being a member of the Club Administration Committee, being a Board Member, along with being on the Tech Committee. She is the President Elect for the 2018/2019 years. Lastly she is the Rotary Coordinator of the Food Pantry Dinner every quarter. Aside from being active with groups and organizations, Shankland Insurance stays current on news, trends and other information that affects those in our area. Staying current with what is going on in the world of insurance is something we pride ourselves on so that we can help our clients to the best of our ability. If you would like to learn more, please give Shankland Insurance a call or contact us today. To see a list of products and services offered through the agency, please visit our Products Page or Request a Quote. 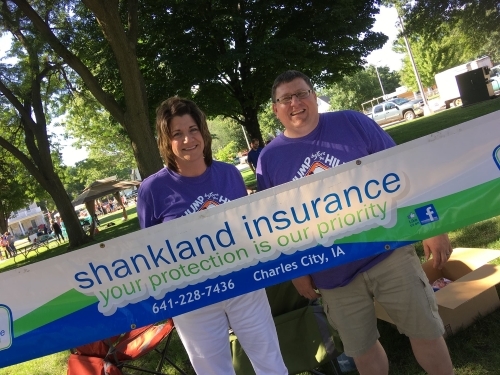 At Shankland Insurance we are proud to provide insurance and risk management services in Charles City and the surrounding communities. We serve all areas in the state of Iowa, Minnesota as well as Illinois.